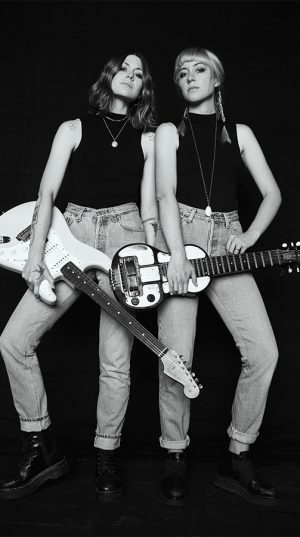 A duo of sisters, Larkin Poe is named for their ancestor Edgar Allen Poe, and it may be that heritage that informs their brooding, intense roots rock originals and reworking of classic blues songs. Since forming in 2010, Larkin Poe have proven a formidable duo both in and out of the studio. In 2014, producer T-Bone Burnett enlisted Rebecca and Megan for Lost On The River: The New Basement Tapes, a project that also saw contributions from Marcus Mumford (Mumford & Sons) Elvis Costello, Jim James (My Morning Jacket), Taylor Goldsmith (Dawes), and Rhiannon Giddens. The sisters have performed at such esteemed festivals as Glastonbury (twice) and Newport Folk Festival; have opened for and been in the backing band of Elvis Costello and Conor Oberst; and supported the likes of Gary Clark Jr. Rebecca and Megan were also members of the all-star backing band for the 2017 MusiCares Person Of The Year tribute honoring Tom Petty (also organized by Burnett) alongside Jakob Dylan, Jackson Browne, Elle King, Lucinda Williams, Gary Clark Jr., Don Henley, and Randy Newman.